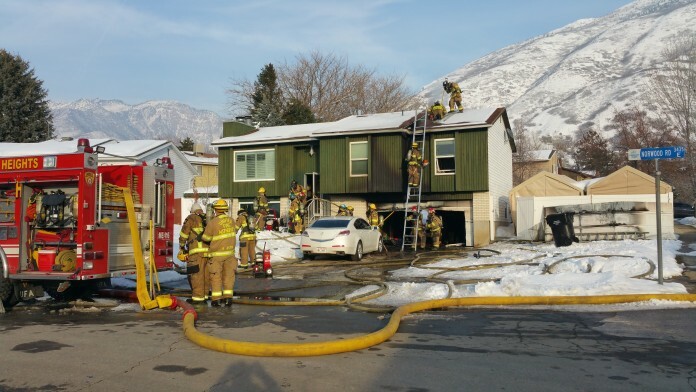 COTTONWOOD HEIGHTS, Utah, Jan. 26, 2016 (Gephardt Daily) — Cottonwood Heights police officers on Wednesday afternoon rescued a woman from the second floor of her burning house using her own ladder. “We arrived at the scene today, and officer (Polly) Harris was on the scene,” said officer John Lovato, Cottonwood Heights Police Department. “She had a ladder up on the second floor, and the window was closed. I asked her what was going on, and she said there was a lady inside the house who was trying to get out. “Between the both of us, we were able to climb the ladder, break the window and help the lady out of the second floor window,” Lovato said. Harris also works for the CHPD. Chad Driscoll lives across the street from the house, which is at 8001 S. Norwood Road (3425 East). Driscoll said the male resident of the house spends a lot of time in his garage, working on projects. Driscoll said he had heard his neighbor might have bumped into a container of gas, which then fell against a light, sparking the blaze. 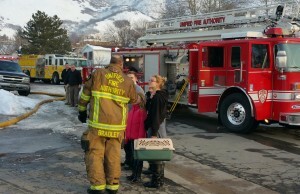 One house cat was rescued and taken to the vet, Driscoll said. A second cat was missing. Lovato said the female resident seemed lethargic after her rescue, and stumbled when trying to walk. Chris Atkin, Unified Fire Authority spokesman, said residents were out of the house when he arrived, and they were taken to the University of Utah Medical Center for evaluation. 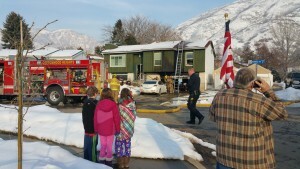 Atkin praised the officers of the Cottonwood Heights Police Department. “The local police departments do a wonderful job, and in this case they were able to help those victims,” Atkin said.